Used in high-heat applications, Inconel is a metal material that is heavy-duty, durable, and resilient. The material is also very expensive, which is oftentimes why metal fabricators and welders will shy away from working on Inconel projects. At All-Type Welding and Fabrication, Inc., we have the experience and know-how to do such projects. Here are three applications for welding Inconel in our record book. MRI and X-Ray equipment have components inside of them that are manufactured through a high-heat process. The equipment used to manufacture these components often have Inconel parts to withstand the high heat for processing. Inconel welding and fabrication are used for specific parts within these machines. These parts must be penetrated and pressure tested to ensure their quality. Inside the manufacturing equipment, these parts must stand up to repeated high temperatures. Inconel metal and welds can help the parts last longer before requiring replacement. While the details may be proprietary for high heat processes, Inconel welding is generally necessary for strength and durability. Inconel welding is nearly always used in high heat situations. While Inconel welding is chosen for these kinds of high heat processes, there is an understanding with the customers that these parts will eventually wear out and need replacement. As with all metal put under consistent pressure, Inconel metal components will naturally break down over time. Understanding the necessity, fabrication process, and longevity desired helps the team at ATWF create high quality products and a fast-turnaround time for future replacements. In this application, the customers are using a fabricated product using Inconel welded components to burn off toxic material. All of the materials worked with by the team at ATWF are used to create components that will be in some sort of heating process. Generally, the parts are being used in a furnace that is specifically designed for whatever is being treated. 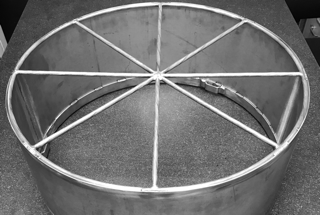 A tunnel is often created, either of tubular or square shape, in which a basket (also Inconel welded) will be pushed through and heated at a high temperature. The burn-off is collected in another chamber for later refuse, but the product undergoing high heat is free of the toxic material. Inconel welds stand up to high heat unlike any other material. Whether in medical, manufacturing, or purification applications, Inconel welding offers unmatched strength and durability. Choosing a company with experience working with the material is crucial to getting the desired results. Inconel is expensive, difficult to work with, and unforgiving to manufacturers and welders. That means that our experience means time and money saved for your company. Contact our team today to learn more about our experience with welding Inconel and how we can use it to benefit your business.